Triple geo-conference goodness coming to Denver!! Denver has always been known as a center for geospatial activity, and we have a great triple bill of events lined up, one in the near future and two back to back in September 2011. The one coming up is WhereCamp5280 on November 19th. Eric Wolf, Ben Tuttle and I ran the inaugural one last year which was a great success, see James Fee's review. I hear a rumor that James will be back this year, so I guess he must have liked it! Eric and I have both been a bit swamped on other things recently, so Steve Coast has kindly taken up the organizing reins this year, thanks to Steve for that! Last year we were kindly hosted for free by Denver University (DU), this year we will be at University of Colorado Denver on their Auraria Campus, which has the advantage of being within easy walking distance of downtown. And this year we've decided to do one day rather than two. 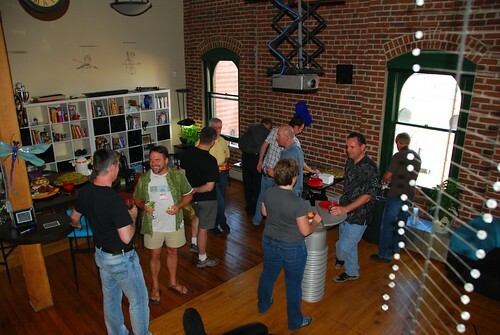 But two things that haven't changed since last year is that the event is FREE, and we'll be holding the social event on Friday evening at my loft, I expect there will be plenty of geo-beer from the Wynkoop Brewing Company downstairs and that may fuel some geo-karaoke later on. All this is thanks to our kind sponsors, who at the time of writing include Enspiria Solutions, ESRI, Google, MapQuest and Waze. I'm expecting a great group of interesting attendees and presentations again this year, so highly encourage you to come along. And remember it's an unconference, so we are looking for as many people as possible to participate - prepare a short presentation or come prepared to lead a discussion on a topic that interests you! Sign up for WhereCamp5280 here, and if you feel like sponsoring at anywhere from $16 to $1024 (can you tell that a techie geek set the sponsorship amounts?!) that would be great, but otherwise just sign up and enjoy the great free education, networking, and beer :). So WhereCamp5280 is a great local event, but in September 2011 the global geo community will be converging on Denver for a fantastic double bill of FOSS4G and SotM. For those who don't know, FOSS4G stands for Free and Open Source Software for Geospatial and is an annual international gathering organized by OSGeo. The last North American event was in 2007 in Victoria, BC, and since then it's been in Cape Town, Sydney and Barcelona, so we're delighted to have Denver join that list, and expecting a great turnout from around the world. Eric Wolf and I led the bid to bring FOSS4G to Denver (which is one of the things we were busy on that was competing for time with WhereCamp5280). Eric was originally slated to be the conference chair, but unfortunately due to circumstances beyond his control he has had to stand down from that, and I have just taken over that role in the last week (well unless the OSGeo board fails to approve the change at their next meeting, but I'm assured that's not very likely!). I'd like to publicly thank Eric for all the work he did to bring the conference here - it was his idea initially, and definitely wouldn't have happened without all his efforts. We have the core of a great local organizing group set up already, but are still interested in recruiting a couple more folks, so if you'd like to help out please let me know. It's going to be a great event, and I'll be blogging plenty more about it over the coming months. And on top of that it was announced today that Denver has also been selected to host State of the Map (SotM), the global OpenStreetMap conference, also in September 2011. I attended SotM in Amsterdam in 2009 and thought it was a fantastic event. Unfortunately I wasn't able to make it this year, but I will definitely be there next year :) ! The two events are distinct, but several people were involved in both bids, and we recognized that a lot of people would be interested in attending both, so the intent is for them to run back to back. The SotM date isn't fixed yet, but FOSS4G is locked in for September 12-16. So if you're in the Denver area already, plan to be at WhereCamp5280 on Nov 19, and if you're not, make plans to be here in September 2011!